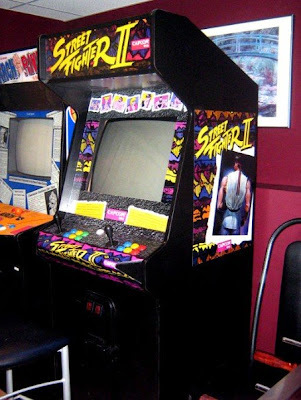 Although I never really played it in the arcade, I have been a fan of Street Fighter since it first appeared for the SNES back in 1992. I recall playing it until the wee hours of the morning trying to defeat the final boss, M. Bison. So when I encountered a rough looking Street Fighter II cabinet at Able Auctions in the summer of 2005, I didn't put a lot of thought into the restoration. I had already acquired an Arch Rivals cabinet the year before for only $50 CDN which only required a few decals to restore, however, this was going to be a completely different story. The bidding ended up between me and another fellow and I managed to secure it for $125 which seemed like a descent deal at the time. When I got the machine home and started going through it I realized I was in for more than I bargained. The wire harness was a chaotic mess that looked like a mangled plate of spaghetti, the monitor was dim and barely displaying, the chassis was being held in place with plastic twist ties and some hideous spiders had set up home at the bottom. The list went on and on. Without going into too much detail regarding each and every step of the restoration, what I thought would take months, turned into years before I knew it. Lots of money and time was thrown into it but eventually I finally completed its restoration. Thanks go out to many friends for helping out including Glen A. for his electrical engineering genius and John Biehler for all around support.